Posted on June 28, 2015 at 11:19 am. Next, if you purchased a license key enter it in the License field. This will enable to import all the games we have in our database. 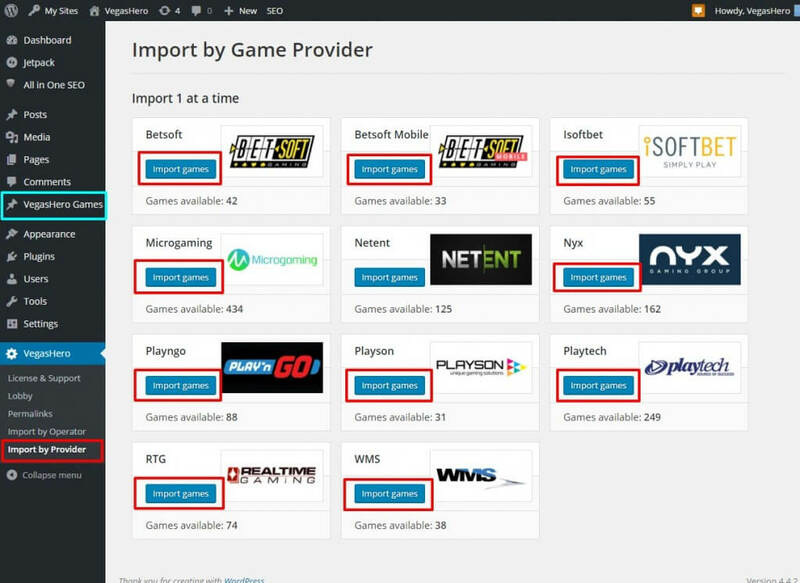 Click on “Import by Provider” and pick software providers to fetch games from. Import from 1 provider at a time as you require. If you want to grab all games just hit import on all one-by-one allowing a little bit of time between clicking the individual imports as the import process may take up to a minute depending on the number of games being imported and the speed of your hosting / server setup. You can add your casino affiliate links and tracking codes under the games using our casino table shortcode. Read further instructions here. If you are having game import or license key activation issues read this troubleshooting article.